I'm telling you, the geniuses behind NVR Enuff Polish can do no wrong. These 4 polishes are absolutely stunning!! That's it for the School of Witchcraft and Wizardry Collection - Part 2! Amazing right!? BUT because Alix and Lynnae are too amazing, I get to show you Universary today as well!! 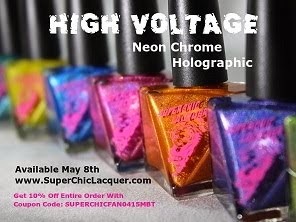 This is their one-year anniversary nail polish and encompasses their brand so well: gorgeous, buttery formula and packed full of glittery fun! Universary: amethyst/plum linear holo packed full with silver and white flakes. Oh man! So many pictures! I hope you guys like the swatches and make sure to mark your calendars for the pre-order of the 4 shades (Herbology, Alchemy, Transfiguration, and Charms) in the School of Witchcraft and Wizardy - Part 2 on August 15th!